I've talked about my obsession with the talented and passionate Penn undergrads and alumni who specialize in spoken word. 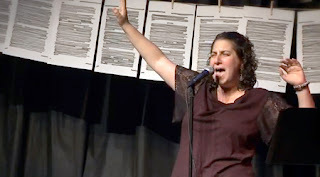 Specifically, over the years, Caroline Rothstein (C'06, The Excelano Project) continues to wow. Earlier this month, Caroline performed another fierce piece about her love for the 1993 Chicago Bulls you've got to see. After the jump, even if you're not a basketball fan, I encourage you to watch the entire 7 minute video to enjoy her enthusiasm, hear her Penn basketball references, and most importantly, learn about why she holds onto the memories of the Chicago Bulls and the deeper, chilling meaning she reveals at minute 6:09. From Rothstein's solo poetry and performance show "After Leo Tolstoy," performed on June 4, 2011, at the Nuyorican Poet's Cafe. On a Caroline/DT related note, her 2007 performance from this DT post continues to get a ton of traffic to this day! Keep up the great work Caroline!